I am never comfortable seeing the word ‘seminar’ before the word ‘happiness’. Following it with the tagline: Stop Thinking & Start Becoming surely did not help. As a friend commented when I posted this photo this morning, ” Becoming what?”. I assume the answer to that is becoming happy. 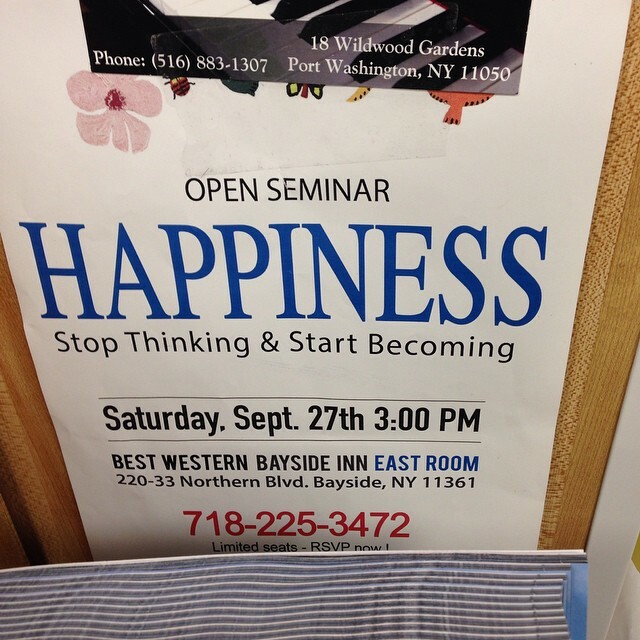 What I found even more amusing was the idea of finding happiness in the Best Western Bayside Inn. In the East Room, of course. In blue type. Assuming that you could never find happiness in the West Room. I sort of hate the ‘I just want to be happy’ declaration. I subscribe to the notion that misery gives happiness context. You have to do a little suffering to get what happy is, right? Wanting to not just be flippant, I felt it was my responsibility to research this a bit. That and I am working through a full-blown bout of procrastination this week. The human mind is an accumulation of pictures that is stored within your mind and body… Through the Maum Method you will become free of pictures and free of the incessant recording, as a result, you will become free of the illusionary false world which is the human mind. No longer trapped in the human mind, you will find your true purpose and reach the state of happiness when reborn in the universe mind. Ok. No judgement. Whatever gets you there. But for me… life IS all about pictures and sounds. Art and music are what make me happy. Oh wait, that is probably not what they meant. Perhaps it is the directive to lose the self and be part of the whole that never works for me. Ok, that sounds like judgement. Honestly, this post was really about something that made me laugh at 6AM on the bagel store bulletin board. But hey, Woo Myung, the founder of Maum Meditation, was awarded the Mahatma Gandhi Peace Price by the UN – NGO, International Association of Educators for World Peace (IAEWP) and was appointed a World Peace Ambassador by the same organization. I love how a funny siting led me down a road to self-actualization.